Here you will find links to all available Russian Army Cards and rules for how to build a balanced Russian Army. During the Napoleonic Era, the armies of Russia underwent drastic changes. Russia had a lot of people and at some points during the Napoleonic Era, they had lots of militia. However, next to these ‘emergency’ units, Russian had also partisans and cossacks that greatly hindered the French supply lines. Russian had a full set of competent commanders, although most were not of the Napoleon/Masséna/Weelington callibre. The Russians were well known for putting up stiff defenses and their use of the scorched earth strategy, depriving enemies the spoils of war. Russian armies can be anything from standard line infantry based to more exotic partisan-cossack based. A relative abundance of cheaper units, make it possible for a Russian commander to have lots of units (and thus: a high breakpoint). The quality of these cheap units is dubious at best. · 1 unit in 6 may be guard/grenadier. This counts for all unit types. So if you have a total of 12 units, you may have up to 3 guard units. 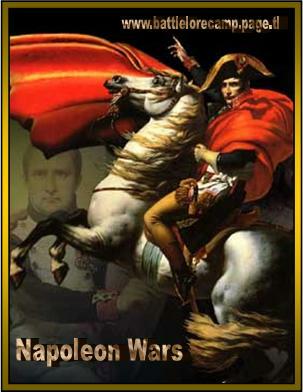 · France can have any War Council mix and all council members can be up to level 3. It may, however, never have more than 1 level 3 general. Today, there have been 6 visitors (54 hits) on this page!